Wind down for the day with a three-course farm to table dinner by the fire at our restaurant. 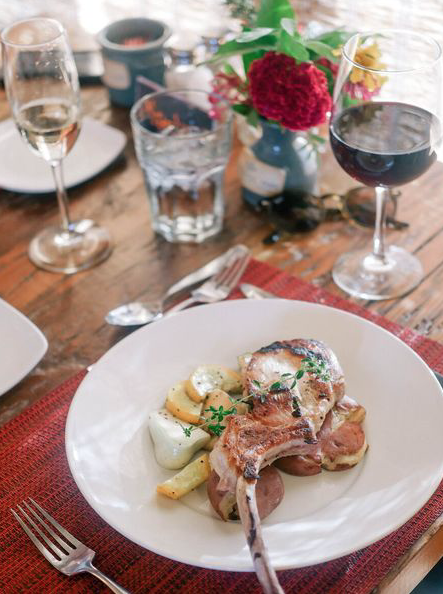 Sage Hill Inn wants to make your Texas Hill Country dining experience unforgettable. Chef Kristen Abram puts as much focus on the restaurant as we do to the rest of the property and the secret is out. We strive to provide as close to 100% local farm-to-table ingredients from local purveyors as possible. Our Chef designs the Prix Fixe menu approximately one week in advance based on available seasonal ingredients. Fresh, local ingredients and vegetables grown in our own garden enable us to deliver incredible quality right from the Hill Country. We strive to select products that are produced and raised locally in a healthy, ethical manner.